BodiesNotApart is the encounter of two artists and their personal approaches to body and dance. 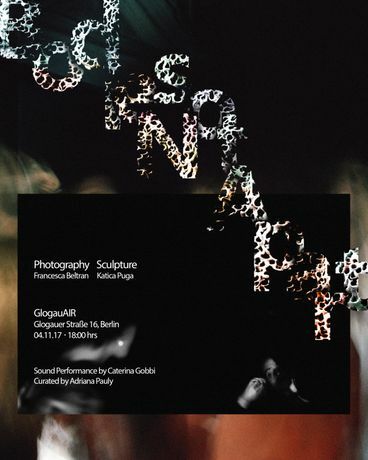 Francesca Beltran's photography and Katica Puga's sculptures oscillate between the natural and the supernatural. In Beltran's photographic series Choreomania, moving bodies break apart into kaleidoscopic rays of light as phantasmagoric shapes move across the paper and melt into abstraction. Ambiguous movements allow for endless associative possibilities: ecstasy or desperation, hysteria or meditation, absolute control or complete entropy, bound only by the frame of each photograph. Loneliness and togetherness permeate the images in equal parts reflecting on the isolating effects of our contemporary culture, in which these opposites constantly collide. Individuality becomes blurred and morphs into collectivity with a shared sense of disorder and anxiety. Puga's undulating sculptures are a direct response to Beltran's work meeting its surging urgency with her anthropomorphic, rhizomatous objects. With no ostensible beginning or end, the body grows and overspills from its center, independent and out of control. “Unlike the graphic arts, drawing or photography, unlike tracings, the rhizome pertains to a map that must be produced, constructed, a map that is always detachable, connectable, reversible, modifiable, and has multiple entranceways and exits and its own lines of flight.” The perforated surface of Puga's sculptures sprawls along the metal rod, self-determined and independent opposing Beltran's panoptic view of confinement. Interlaced by the allusive sensuality in both works a slow dance between oppositional forces arises, tying the individual bodies unequivocally together. By emulating the movement of the exhibited pieces, sound and performance artist, Caterina Gobbi will perform her digitally modified music alongside the exhibition. The interaction between the three forces becomes a communal investigation of the digitization of society and its contradictory nature, inviting each visitor to join the dance and become part of the collective experience. Francesca Beltran is a Mexican visual artist currently based in New York. She graduated from the Fashion Institute of Technology in New York in 2014. In 2016 Beltran participated in Belligerent Eyes | 5K Confinement, an experimental media research facility at Fondazione Prada in Venice focused on contemporary image production. Her most recent exhibitions include PERSONAL STRUCTURES - open borders (2017), a contemporary art exhibition in the context of the 57th Venice Art Biennale, hosted by the European Cultural Center in Venice, Italy; Together We Rise (2017), a short film commissioned by the Women's March on Washington, and No Name (2016), a group exhibition at the Rufino Tamayo Museum in Mexico City. Her work has also been showcased on national and international publications. Katica Puga is a Chilean artist living in Berlin. Her formal studies are in architecture, graduating in 2016 from the Pontifical Catholic University of Chile, though dedicates professionally as an artist since 2014 exhibiting in Australia, Chile and Europe. In 2016 she was mentored by the Chilean artist Eugenio Dittborn and in 2017 moved to Berlin to carry out an art residency at the Institut für Alles Mögliche. Her recent exhibitions include Vita Tua, Vita Mea in Venice (2017) and Fieber Festival in Berlin (2017). Caterina Gobbi is a visual artist whose work spans between performance, installation and sculpture. She is currently undertaking an MFA at the Royal College of Art in London. She is part of the Milan based collective MADAM, the second half of musical duo TCTC, and recently exhibited at Square Gallery in London.